There was nothing! 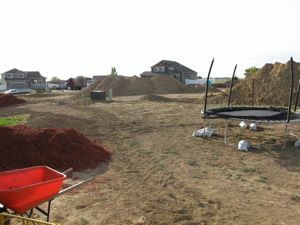 So last year we spent all year hauling compost (I think 12 truck loads if I remember right) and collecting leftover dumpster bound sod from the workers as they build the new houses around us to get our backyard started. 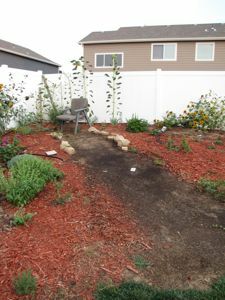 With 4 kids, there was a LOT of mud so sod was the first thing we put in. 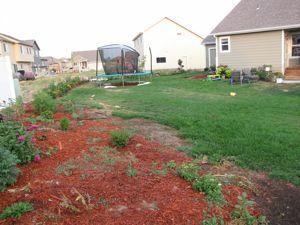 This year we spent a lot of time working in more compost and hauling 3 truck loads of free wood chips to get the beds mulched before I planted. Well, that was a bad idea. After all of my 30 packets plus 2 HUGE manila envelopes of seeds did not come up when I planted them, we discovered that the mulch we got had a pre-emergent on it, which prevents seeds from germinating. I also found out that the plants do NOT like the soil here and therefore died in my homemade soil mix. 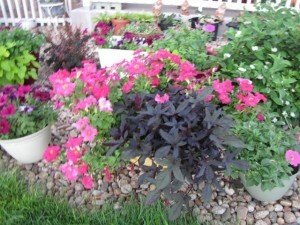 So… I ended up replanting this year 3 times in most of the garden and containers. Finally, around the 1st of August my hard work has been rewarded! 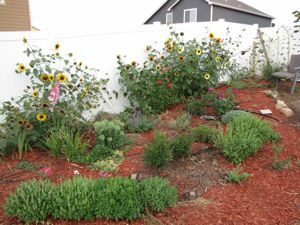 So I would love to show you some of my gardens! 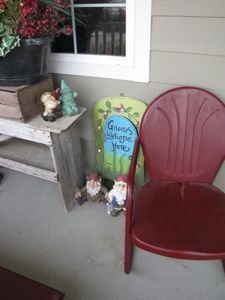 My front porch. I found these cute little buckets for .25 each at a yard sale and of course snatched them up! Aren’t they cute! These are my great grandparents’ chairs that they used to have their front porch. 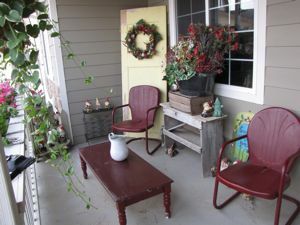 I have both, I just love these old chairs! 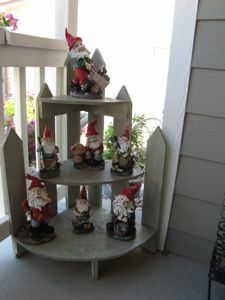 Of course, here’s a small section of my huge collection of gnomes! We have nothing but rock surrounding the house. This year we had so much to do there was no way I was going to move a ton of rock, so this year it’s container gardening up near the house. You can’t see it but this is my wheelbarrow. I love it and can’t believe how it’s filled out! 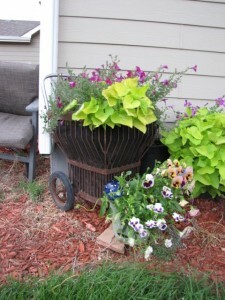 I just lined the basket with landscape fabric, cut a few holes in the bottom and then filled it with soil. 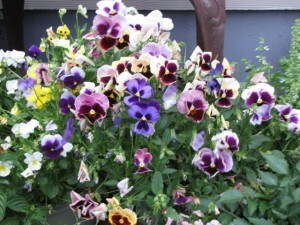 One of the best reasons to live in Colorado– Pansies all summer long!!! My coleus right next to the front step. 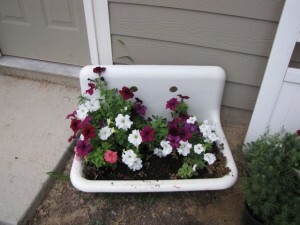 My old curb find sink. Of course Mike was just shaking his head when I had him put it in the car. I’ve dragged this thing around for at least 10 moves, maybe more! My old stove with containers all around it. My tipsy tower I only replanted 3 times!!! It’s going to be only commercial potting soil around here until I can get the soil worked and some compost made. 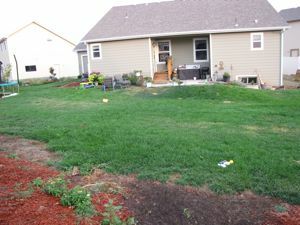 Those are the neighbors weeds behind it. 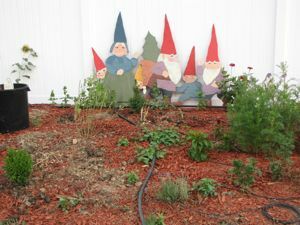 We have a lot of perennials started so hopefully next year it will all be blooming. 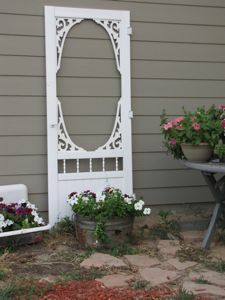 We brought this screen door from our old house. I just LOVE, LOVE, LOVE it and wasn’t about to leave it. The problem? 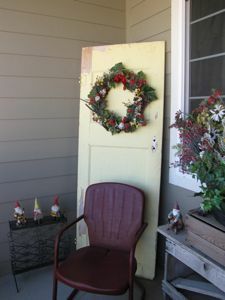 It won’t fit on our front door and our back deck is too small for it to be on the door. 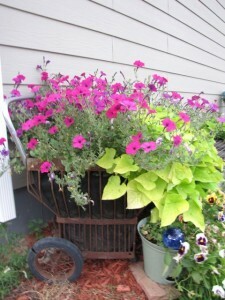 In this corner I have one of my favorites– my milk container garden!! I only had to replant it 3 times but it was worth it! Here is the view from the garage door. I can’t believe we’ve come so far! 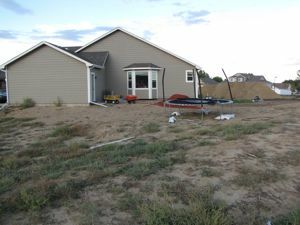 In this corner we are going to put a pergola in very corner and then toward the front we are going to put an arbor with the gate in the middle and fencing going off to each side. 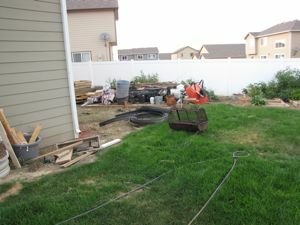 I’ll be using antique fencing from my very first garden in my first house, 20 years ago. I was able to save it when my uncle said they might be tearing down my old house in the future. (It was my great grandparents rental house.) This year I just stood up the gate so I could at least look at it. See that huge pile of stuff. Well that’s all sitting on my shed. We have the wood. 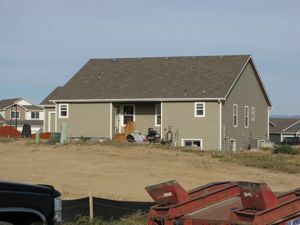 We collected it from the dumpsters as they were building the other houses. For now until we can afford the siding for the shed all the wood is tarped and my garden supplies are sitting on the tarp. So that’s it for this year. 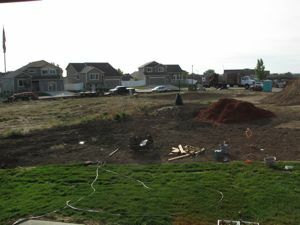 I have two trees to plant and then I’m done! Yeah it was a TON of work but it was nice to do when my 3 year old wanted to be outside. I had to stay outside with him because the entire fence isn’t up yet. Now I get to enjoy the fruits of my labor! 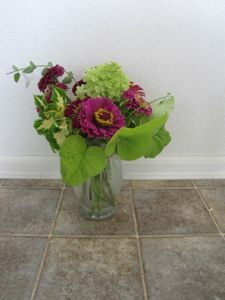 These arrangements are from plants in my garden. Oh.My.Goodness!!! An incredible amount of work and a simply WOW result! 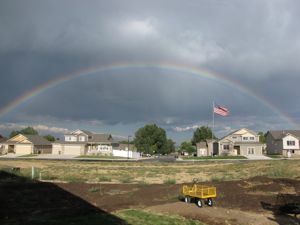 Thanks for sharing the photos! I just love what you did and for such a small amount of money. I just don’t have the energy I did when I was younger, but I really love what you did. Great job!!!!! What imagination and ingenuity to use all you did. It’s absolutely beautiful! This is absolutely gorgeous! Awesome job! That door leaning against the house is so beautiful. It would be on my front door if it was mine. 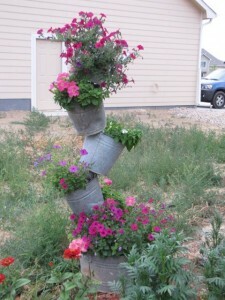 Darling topsy-turvy planter! Did you make that yourself? Or was it purchased? I made it myself and just LOVE, LOVE, LOVE it!!! You’ve done a beautiful job. We’ve lived on our property over 7 years and we’re still working on getting all the beds done. It’s a lot of work! I can appreciate the amount of effort you put in this :). Tawra….I am in AWE!!! What a GREAT job!!! 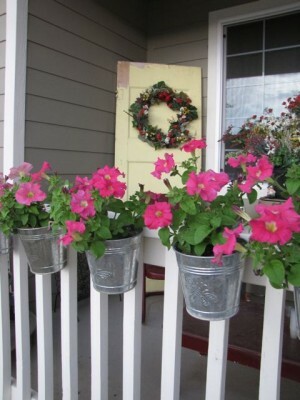 God Bless you and your family as you continue to ‘bloom’ in your new home!!! The plants that you use, are they all seedlings, or from flats?? 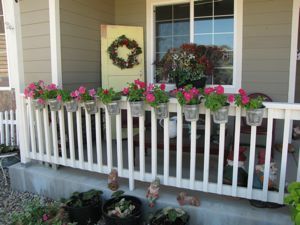 I did mostly seedlings but the petunias out front were from clearance flats. Lovely…but I don’t have the time or energy or $$ to plant 3 times!! How do you do it? Well honestly I didn’t either. I just forced myself to do it because I was bound and determined to have a garden this year. It’s been almost 10 yrs. 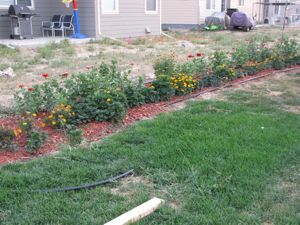 since I’ve had a “big” garden due to pregnancies and my illness (Chronic Fatigue Syndrome). As new seeds would pop up or I would find clearance plants I would put them in the ground. I didn’t much as far as $ but I did spend a lot of time but I did it while I was watching my 3 yr. old outside. have over 120.00 bucks, at least here in my town. 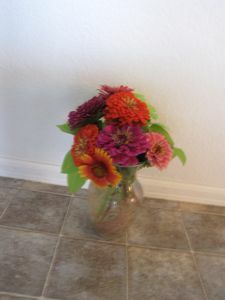 I have my home on the market and have purchased fresh floral arrangements and that is the going price. 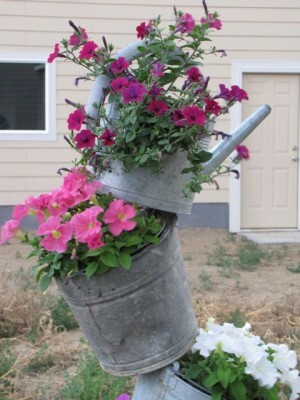 Just thought of a new way for you to bring in income with your green thumb! LOL . Stagers are now telling Sellers to put fresh floral arrangements around inside their homes, so , YOU , Tawra, can start a business selling cut flowers to Sellers!!!!!!!!! Under price Floral shops and there you go!!!!! Your arrangements look as good or better than what I have purchased and probably yours would last longer! 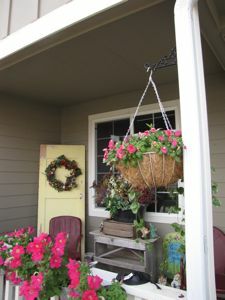 In the Winter you could do some “greenery arrangement” for the Sellers when cut flowers weren’t available. Get with Stagers and get free advertisement! You did a nice job on your flowers! As an avid gardener, I have a few ideas for you. 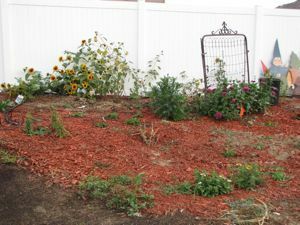 I planted a butterfly garden this year, I focus on planting native to give back to the environment. 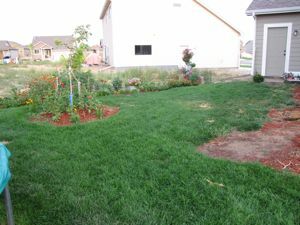 Here is my secret receipe to ammend the soil, (not so secret anymore)Dig a hole bigger than the plant & remove as much of the bad soil as you can (here in Chicago we have clay)& replace with Composted Manure. It’s approx $1.00 for a 40lb bag, & everything grows profusely in it! I also ammend with Starbucks coffee grounds. Call your local Starbucks, & they will give several large garbage bags of the grounds, then simply mix them in. Also add Peat, the generic is just as good as the name brand. Finally, I send my daughter to the bait shop, & she picks up a few containers of earth worms. Gently place them in a shady spot & let them do their job. I also group plants together acccording to thier water needs. 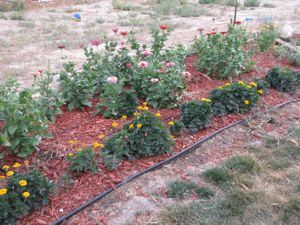 For Example, the Zinnias & Purple Coneflower are near each other, each prefers rather dry soil, so I don’t have to water as often, this also keeps the water bill down. 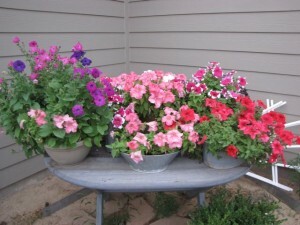 Planting those with the same sun/water needs ensures greater sucess. 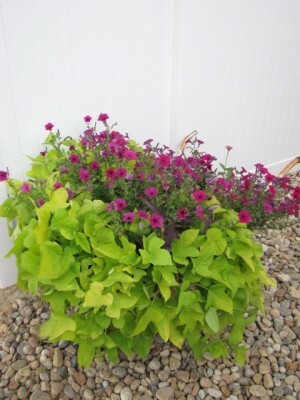 I also buy online from http://www.harvestgardensupply.com.I have got strong healthy plants with a good root system every time. 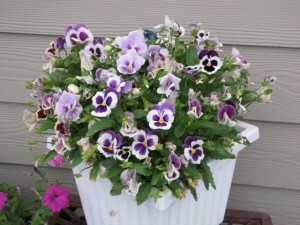 They are smaller plants but cost 1/3 of the price I would pay at the nursery. They also give rewards points with each order. I accumulate the points to get free plants or free shipping. It takes a season for the smaller plants to reach maturity, but that’s ok, in gardening there is always next year. It takes a little patience but it’s worth it! 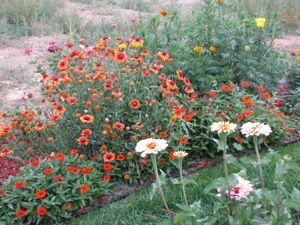 I also started my Zinnias from seed this year. I didn’t use any special trays or lighting, I planted them in Peat & put them under the sunny kitchen window. I also buy off of the dying/not doing so well table & nurse the plants back to health. 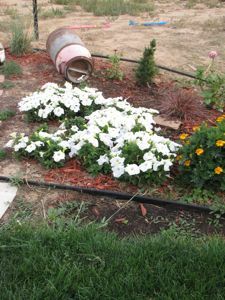 (not recommended for new gardeners).I also bought many smaller size Phlox plants from the nursery that look breath taking! Next year they will be full grown. 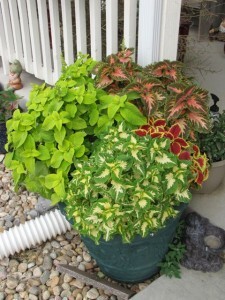 I saved a lot & was able to buy many more by buying the smaller plants. Don’t forget to MULCH! Protect your investment! All you need is layer 3 to 4 inches deep. 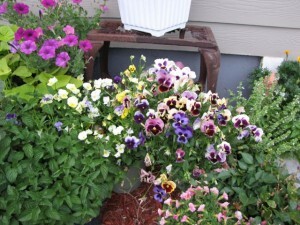 Mulch helps retain water, invites good insects to turn the soil, & in a must to over winter your plants! Don’t over mulch your trees, 4-5 inches is all you need. 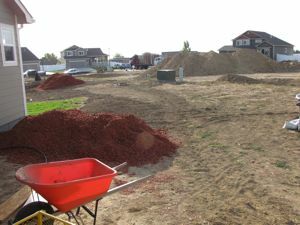 Too much mulch will encourage bacteria growth & will kill the tree slowly. Finally, look for end of the year sales. 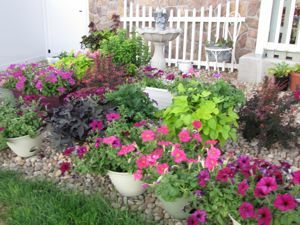 I’m in Chicago, & I can still plant in September & get enought root growth to ensure the plants survival over the winter.I get so excited about my butterfly garden, please look at my facebook page, & please “LIKE” my page, I would appreciate that so much! I hope you enjoy my page! 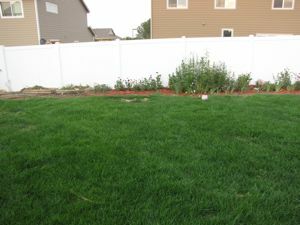 I’m also at hometalk.com, put this in the search bar: the yard I created at my mobile home, to find my pics. 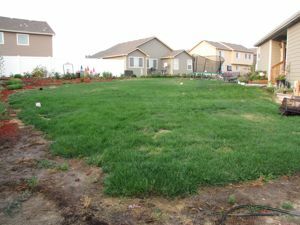 I transformed my entire yard & did it all on a budget! The first thing that sells out at our farmer’s market are the flowers. 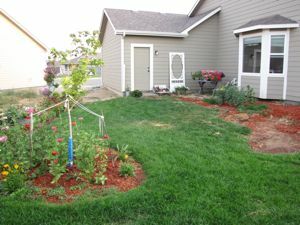 The state of Kansas has a program through the Extension Service for floraculture since it’s a big thing. 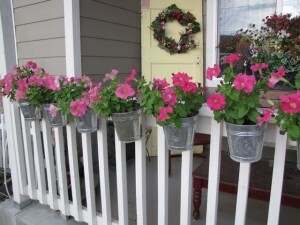 I was going to ask you how you could keep your petunias from burning up in metal pots but then you reminded me you are in CO. Here in Topeka when it was 110 to 112 stuff cooked when I watered it. I’ve lost so many perenials this year I could cry since I only planted them last year. They all came up and looked good until the heat got started. Your place is just amazing. I used to be able to do all that but I’m just too worn out. I had an allergic reaction to something outside and would itch and break out any time I tried to be out for a month and a half. Thank God it’s over now. I can say this has been the worst uommer ever. Maybe I need to move to the mountains. It looks so pretty there and you deserve it. You do so much for us online. I don’t always post but I’m reading it all. Thanks a thousand times over. Yeah, when I lived in Wichita most everything just burned. It’s great that even though it’s been in the 90’s and 100’s this summer I still have plants living. It’s even better that they were shredded by hail either. Great garden and I know how much work and effort it must have taken. 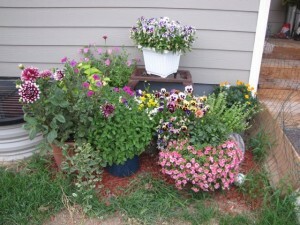 I will miss my garden when I move to a condo next year, but I will still have a few container plants. : ( or the grim reaper…or something. LOL! Yeah I have some tomatoes and peppers and 1 zuchinni in this year. Everything else died. 🙁 I’m going to plant my veggies in with my flowers next year.